Mallorca is a seductive Mediterranean island just off the coast of Barcelona. In addition to breathtaking sea views and an array of exquisite turquoise coves, it offers a dazzling landscape dotted with ancient hilltop villages and an incredible mountain range that is so special that it has declared by the United Nations as a World Heritage site (UNESCO). The island boasts a rich history involving the Romans, the Vandals and the Moors, and its cuisine reflects an interesting tapestry of these past conquerors. Mallorca’s wines are what every adventurous wine lover dreams about: new grapes that you’ve never heard of (that are not grown anywhere else), moderate alcohol levels, and wines made from gorgeously ripened fruit. Morning: FREE to allow for arrival of international flights. It is strongly advised that you arrive some days in advance to allow for adjusting to jet lag and to see the island’s charming capital city of Palma. Wine-Knows can arrange early arrival hotels. Afternoon: The tour begins mid-afternoon in downtown Palma at a central pickup spot. 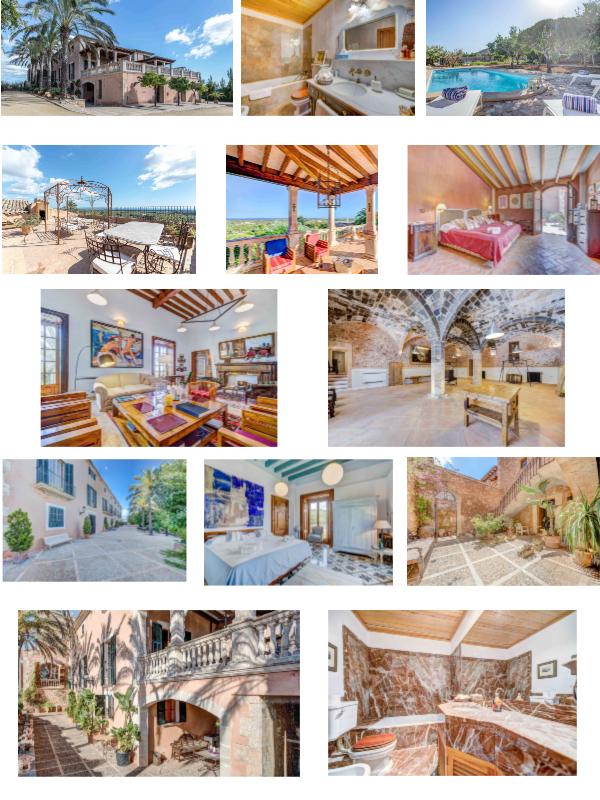 You will be transported by a private bus about 40 miles to our magnifico villa between the famous beach of Cal D’or and the picturesque harbor of Porto Colom (details of the villa can be found in the FAQs). There will be time to relax and explore the luxurious old-world hacienda which boasts an extraordinary art collection, a pool, and multiple terraces with views of the distant sea. Evening: Tonight we’ll dine on the panoramic terrace and watch the sun as it dips into the nearby Mediterranean. 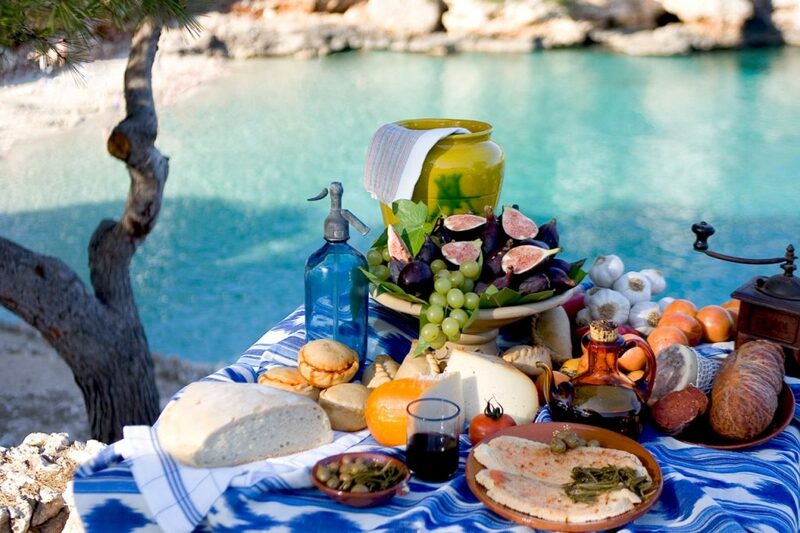 Dinner will be Mallorcan specialties prepared with the olive oil produced at the villa, along with produce from the estate’s garden. 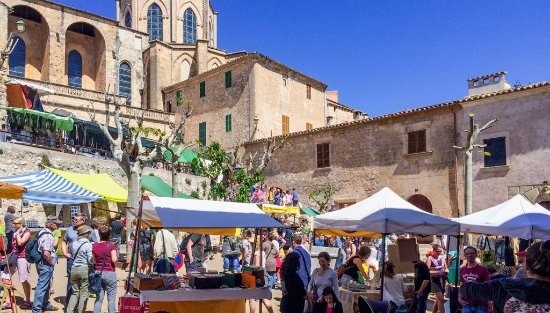 Morning: We’re off to a colorful weekly market filled with a cornucopia of early autumn produce, as well as leather items for which Mallorca is famous. There will be free time to explore this small but charming town. Afternoon: Next, there will be a private tasting a one of Mallorca’s culinary gems: a high-end producer of special sea salt. Developed by the island’s first Michelin-star chef, this flor de sal (Spain’s equivalent of France’s fleur de sel) comes in such flavors as black olive, hibiscus, Mediterranean herbs, and wild mushroom. 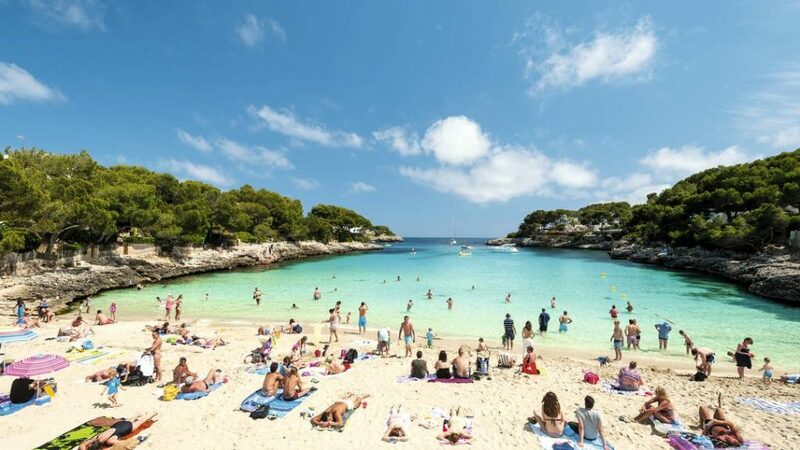 We will finish up the day at the beach resort of Cala D’Or where you’ll have time to shop in tempting boutiques, walk along the aquamarine beach, or relax at a scenic outdoor café. Evening: Dinner will be at the villa and include a special pairing of the island’s super-star wines. Afternoon: Today we’ll visit nearby Porto Colom, an authentic village of colorful fishermen’s homes with a laid-back vibe, but also offering jaw-dropping beach scenery and a quaint harbor. Thought by many to be the actual birthplace of Christopher Columbus, the seaside charmer has been named after him. Next, we visit one of the oldest castles on the island. Begun by the Romans and then enlarged by the Moors, the castle was occupied by the military up until the mid 19th century. Then we’ll journey to the hilltop Monastery of San Salvador. One of the highest points on the island, the church offers a spectacular view of the entire eastern coast. Evening: Tonight we’ll be dining out at one of the best restaurants on this side of the island. Attractively situated on the main plaza of our town in a charismatic old building, this restaurant serves a fantastic selection from Mallorca’s waters and land. 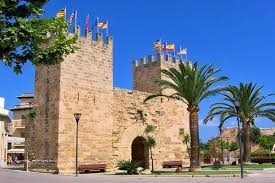 Morning: Now we head to the northern side of the island to visit one of the most special towns on Mallorca. Alcudia is a treasure-trove. Founded BC, it has been inhabited by Phoenicians, Greeks and Romans. Today, the architectural gem offers a step back in time for history buffs, as well enchanting back streets filled with pretty squares and enticing shops. Afternoon: Next, we’ll visit one of the island’s top producers of olive oil whose special product is used by many of the island’s best chefs. This will be followed by a tasting in a bodega that produces some terrific wines. Evening: Tonight will be a relaxing dinner at the villa. 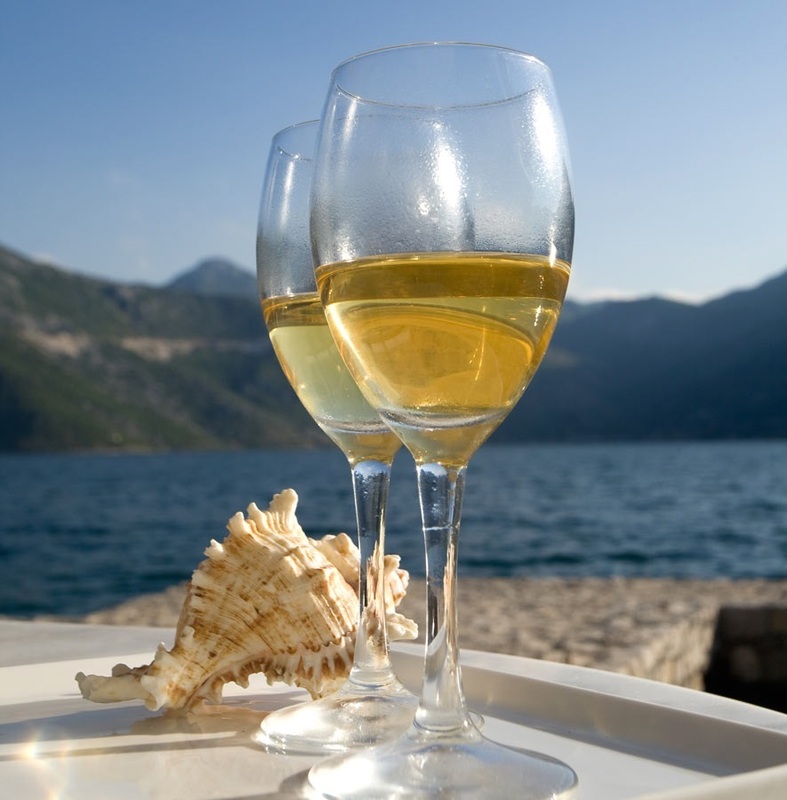 Afternoon: Today we have private tastings at two of the very best wineries on the island. One winery has taken over a deserted 16th village and completely restored it. The next winery makes the best white wine on the island…and maybe one of the best in all of Spain. Even Robert Parker gave this wine 95 points. 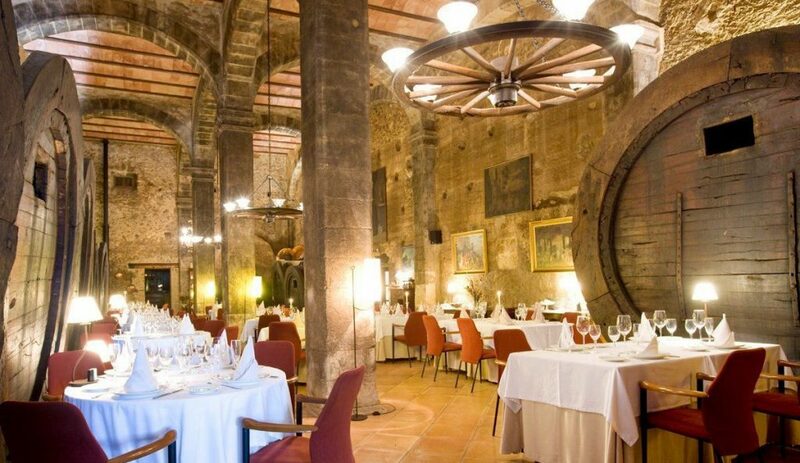 Evening: Dining tonight will be in a very romantico setting in an old winery. While the venue is nothing short of spectacular, the food is the real star of this gourmet show. Morning: We journey to the center of the island to visit the birthplace of Father Junipero Serra who was responsible for founding the historical California missions. Then, on to Mallorca’s most authentic outdoor market. This one has live animals and poultry, in addition to beautifully ripened vegetables and fruits. Afternoon: Mallorcan pearls are famous the world over for their close resemblance to authentic pearls. You’ll learn all about the process of how these pearls are made, and be able to buy them at a fair price at one of the best pearl factories on the island. Last, before we return home to the villa, we’ll have a private wine tasting with one of Mallorca’s mover-and-shaker winemakers. 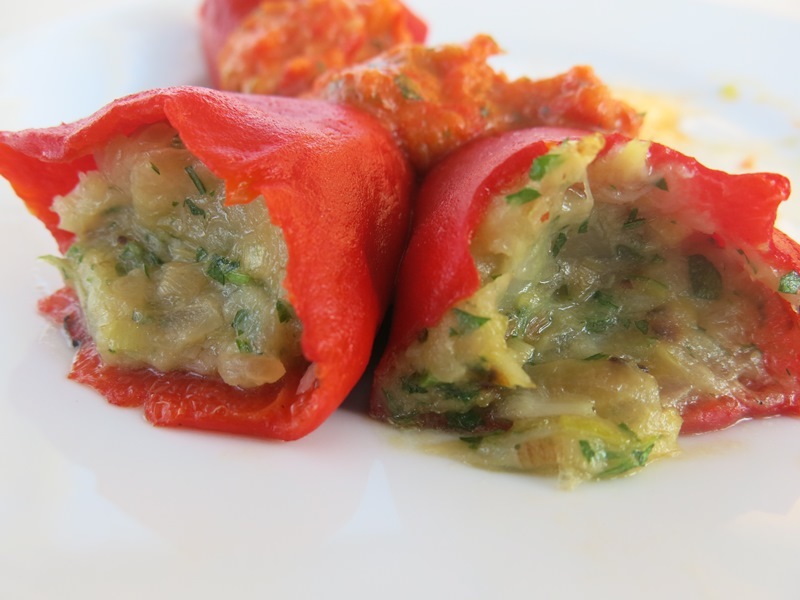 Evening: We’ll kick off the evening at the villa with a tapas demonstration of two quintessential mild Spanish peppers: smoky stuffed piquillos and sautéed padrones. Next, dinner will be a tapas buffet feast. Morning & Afternoon: Free to organize your luggage, go to the beach, or head to the capital city of Palma for more sightseeing or shopping. Evening: Gala farewell dinner at the villa featuring the favorite wines of the week. For those continuing to Granada and Seville, you will be transferred to the airport after breakfast. For persons heading to other destinations, Wine-Knows will be happy to organize transport. The tour begins in downtown Palma de Mallorca mid-afternoon on September 24, 2021. Pickup will be at a central location in the historic center. 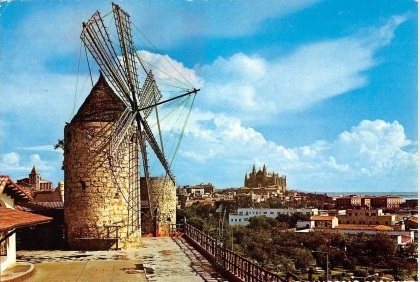 It is strongly advised that all participants arrive in Palma a minimum of one day before to avoid any missed connections with the group. (Wine-Knows will be happy to arrange for early arrival accommodations). Our groups are composed of people from diverse occupations, singles & couples, men & women, a mix of young & old, well-seasoned international travelers as well as novices. All have a common interest in food & wine. The majority of participants on our tours are repeat clients or their referrals. In addition, each tour participant is a non-smoker. While the original villa dates back to the 14th century, there have been countless enlargements and renovations over the centuries. Each bedroom has an ensuite modern bath. The property has >20,000 square feet of living area, however, WineKnows has leased the main villa which has >10,000 square feet spread over three floors. 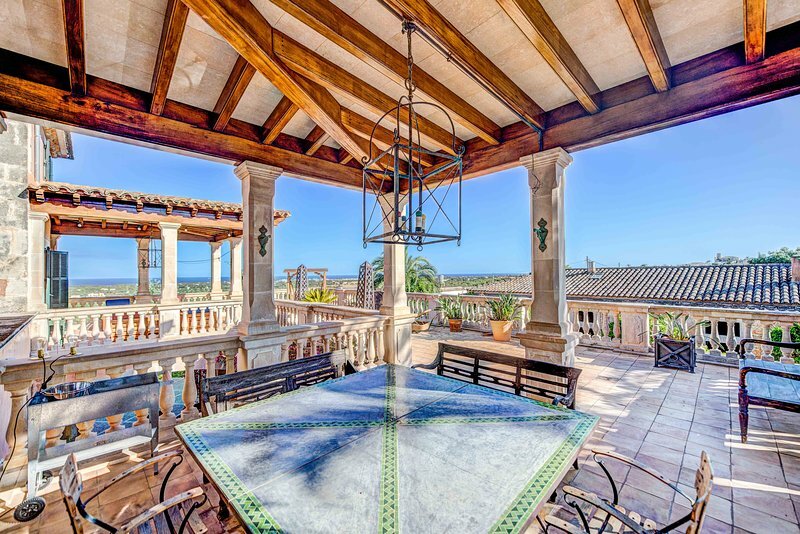 There are extensive terraces on every level, all offering views of the Mediterranean located <2 miles away. There are over 1,000 olive trees on the property, along with a huge number of fruit trees, and a vegetable garden. A swimming pool is located in one of the gardens. Dining experiences have been mindfully selected. Dinners will range from one of the island’s most sophisticated restaurants to an off-the-beaten track farm-to-table affair. Several of our dinners will be held at our fantastic villa where different guest chefs will cook Spanish specialties such as paella and gazpacho. A tapas demonstration will also be conducted one evening. What are the mobility and physical requirements of this trip? Participants must in good physical health and be able to keep up with the pace of the group. The tour often requires climbing two or more flights of stairs in wineries, walking distances of up to 3/4 mile (1200 meters) at a moderate gait, and negotiating cobble-stone streets and other irregular surfaces including dirt, gravel and/or wet surfaces. Note: the majority of our villa’s bedrooms are upstairs and there is no elevator. Participants will be required to carry their own hand luggage and personal items. Concerns over any aspect of the tour’s physical requirements should be addressed with Wine Knows before placing the trip deposit. The tour will be business casual. One night we will be dining at a sophisticated restaurant and we suggest a sport coat for men, with a commiserate level of attire for women. Do bring non-skid shoes for visits to wineries…they will be finishing harvest operations & floors will be wet & filled with a variety of equipment which can cause safety hazards. Also, pack a swimsuit as the villa has a pool. September in Mallorca averages 70-80 during the day. Evenings can be cool so plan accordingly. The price is based upon double occupancy. Should you wish to share a room, every attempt will be made to find you a roommate (most of the time we have been quite successful in doing so), however if we are unable to find you a roommate, you will need to pay the single supplement of $993 US. We have provided free time as detailed in the itinerary. Furthermore, it is not mandatory that you attend all of the planned experiences, although most of our clients do! This is your trip—if you would rather sleep in, shop, or simply chill at the villa then do so! A second installment payment of $1,200.00 US is due by February 2, 2020. The third installment of $1,200 is due by November 1, 2020. The final payment is due by April 1, 2021. Please make all checks payable to Wine Knows Travel, Inc. Trust Account. Refund/Canellation Policy. A non refundable fee of $250.00 US, applies for all cancellations. Cancellations received prior to October 1, 2019 will be fully refunded less the cancellation fee. A 75% refund of the remaining funds will be made to those who cancel between October 2, 2019 and March 1, 2020. A 55 % refund of the remaining funds will be made to those who cancel between March 2, 2020 and November 1, 2020. A 25% refund of the remaining funds, if any, will be made to those who cancel between November 2, 2020 and March 1, 2021. There are no refunds for cancellations after March 1, 2021. Trip cancellation insurance is *strongly recommended* and can be purchased for a nominal premium. Cancellation date is determined by the date notice of cancellation is received by Wine Knows Travel Inc. at the place of notice below.